Must Escape the Dragon Cave - Selfdefiant is one of the most prolific game designers out there and, sort of like Stephen King is to fiction, this results in a diverse gamut of escape adventures for us to indulge in. As part of his "Must Escape" series, this episode has just enough going on to court the adventure tag while remaining compact enough to fit nicely into Weekday Escape. It begins like this: you were enjoying a nice tourist stop at a dragon cave when you suddenly felt very tired. So, you went down for a nap, right then and there (hey, narcolepsy is nothing to trifle with). Upon waking everyone was gone, leaving you trapped. 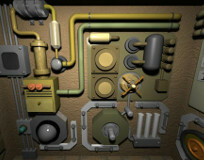 Lucky for you, the whole place is rigged with locks and codes that a little exploration and ingenuity will soon crack. The changing cursor helps guide your investigations as you gather up necessary items and clues but some of those clues can be easily overlooked in the details. Still, with some methodical searching, the hindrances to your liberation are few. 2015 New Year Escape - Even if you don't read Japanese, you should encounter no language barriers in this nifty creation from Pixel Kobo. Just click past the first few screens and you'll find yourself immersed in a rather intriguing scenario: Apparently you're exploring the secret insides of a mechanical box. The scope-like cursor and navigational arrows along the frame indicate a more hi-tech venture as you inspect walls covered with pipes, pistons, levers and cranks, all animated and quite lively looking. You could say this game has a very Haretoki familiarity although it's more about inspiration than imitation. To succeed in this venture, click on everything—the resulting responses range from nothing to amusing to highly helpful. Despite the effusion of interesting gizmos, the game itself is quite short, much too short (its only disappointment). After you've honed in on the clues themselves, completing the puzzle and opening the box is a snap. Small Room Escape 1 - There are times when all you want is a small fix, just a teeny little exercise in decoding and escaping to satisfy those urges. Small Room Escape 1 from Umi Escape is remarkable for one reason: it lives up to its title in the most quintessential way. Lending new meaning to the phrase "short and sweet," this miniature escape will hold you up only as long as it takes you to interpret a smattering of coded clues. Once you've learned the game's lingo, you'll be well-equipped to solve the puzzles and acquire the three tile pieces needed to open the door. Just keep in mind that you'll need to place all three tiles at once (they won't stay in the slots otherwise), and achievement unlocked door is all yours! Weekday Escape N°57 Walkthrough now available! I'll be referring to the four walls of the room as follows, from the starting wall and proceeding to the right: the heart wall, the green panel wall, the propeller wall, and the number panel wall. Turn right once to face the green panel wall. Near the center at the bottom of the panel is a large green button. When you press the button, a panel opens to reveal eight symbols, loosely described as follows: "triangle, cross, diamond, star, circle, hash, square, concentric-circles." Each of these symbols corresponds to a number. Your goal is to match each symbol to its number. For each pair, I'll start by telling you which wall(s) you should investigate, then provide the more specific locations. Just below and to the right of the propeller is a row of three tall gray buttons. Pressing and holding the second button causes the dial to the left to rotate and reveal the match: triangle = 1. For this symbol, you'll need to flip the two orange switches in the panel on the left in the correct sequence. Take a look around the room for additional switches that look like these. The sequence can be found on the heart wall: left, right, right, left, right, left, left. When the light on the panel below the switches turns red, you've entered the correct sequence and can open the panel to reveal the match: cross = 7. In the upper right of the lower panel are two rows of four buttons each. Pressing the third button in the second row opens a panel that reveals the match: diamond = 4. Just above and to the right of the propeller is a column of four buttons. Pressing the third button causes it to pop out, revealing the match: star = 8. The lower panel is surrounded by four gray brackets, one of which looks slightly different from the others. Clicking the green hinge on the lower left bracket rotates the bracket to reveal the match: circle = 5. At the top of this large panel are two smaller square panels. Pressing the button on the left panel reveals the match: hash = 2. Toward the lower left of the lower panel are two small buttons, arranged vertically within their own panel. Pressing the lower button opens a panel that reveals the match: square = 3. Take a close look at the five columns of gadgets with the moving pistons. Clicking the fourth valve just above the green LED reveals the match: concentric circles = 2. By now, you should have an eight-digit code to enter into the number panel, but it looks like the panel's missing something. There's a relatively prominent pair of switches on another wall that you haven't used yet. Check out the "plus" and "minus" switches on the heart wall. It looks like they need to be pressed in the correct sequence. The clue for these switches is on the propeller wall. Press and hold the blue-green button in the lower left to reveal the sequence: plus, minus, minus, plus, minus, plus, plus, minus. When you've entered the sequence correctly, the heart-shaped panel above the switches turns orange, and you can open it to take the LEVER. Insert the LEVER into the slot next to the number panel. Enter the code that you've assembled from the symbol and number matches: 17485232. When the LED turns green to indicate that you've entered the code correctly, click the lever and win your freedom! We start at a door with a panel next to it. There are 3 diamond shapes we need to collect to put in the panel. Turn left, and zoom in on the table, then click to zoom in on the box. We have a string of L and R, and two buttons to press, so L means left and R means right. But if you use the letters shown it won't work. If you click on one of the buttons, notice that the square flashes blue. You need to only use the BLUE letters for this puzzle. Now we got our first diamond piece. Zoom all the way back out and turn left again. Click on the table here, and then again on the box. It says SUN, and we need 3 numbers to put in. You'll notice that there are letters on all the walls except the one with the door. You need to count how many S's, U's and N's there are, and put those numbers in. This gives us the second diamond piece. Turn left again to get to the last table. Zoom in on the box, and you'll see 3 circles: red, black (I know it looks grey, but it's meant to be black) and yellow. The box needs 3 letters to open it, so all you have to do is find the letter on one of the walls that matches the colour. It will spell out a word! This gives you the last diamond. Go pop those diamonds into the panel next to the door, and out you go! the red Dragon egg (I know where this goes). To use the slingshot, look for a changing cursor. To find the clue for the four circles, break the rules. Wow. Thanks for the assist!!! I can't believe I didn't spot either of those things. When I read "break the rules", I started pushing old ladies out of bus seats so I could sit, walking on the grass, wearing white after Labour Day, all sorts! But nothing worked. But by then I was much happier with life so I tried playing the game again, and got through. but none of them appear to work on any hot areas. What am I missing? Goodness, I had no faith in the Power of Posting, but verily, it works. I'm out! Look at the top pamphlet by the entrance. Enter the code by color in the cabinet next to the sealed cave and take the lantern. Take the matches from the hole in the ground next to the fenced off area. Light the lantern with the matches. Use the lantern on the roped off area. Get the time from the entrance gate. Enter the red numbers in the panel at the base of the warning sign, and take the rope. Use the rope on the stalagmite by the chasm. Get the screwdriver from under the dragon plush souvenir. Use the pickax on the rock blocking the last section. 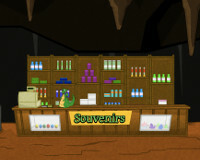 Get the color of the eggs under the the cash register at the souvenir stand. Enter the code in the panel behind the counter in the entrance. Take the money from the hole near the key rock. Use the money at the top of the vending machine to take the slingshot. Get the rock in the bottom right corner of the screen with a river of lava. Use the rock and slingshot together, and then on the top of the stalactite above the roped chasm. Clear away the pile of rocks to show the blue egg. Pick up the barrel next to the Blue Egg. Place it under the blue crystal next to the velvet ropes, and break a piece off. Use the crystal on the river and collect the egg. Place the three eggs on the pedestals next to the lava flow. Look over the edge of the fence and take note of where the outcroppings are. Use the positions to unlock the chest just inside the roped-off area. Take the shovel. Use the shovel to scoop up some lava from the flow. Place the gold in the key rock and heat it with the lava. Take the key and use it in the front gate. In New Year Escape, the symbol for the star was hard to see clearly. In small room escape, I couldn't see the link between the Left Right sequence and the blue button flashing, so as a last resort I tried reversing the sequence. Oddly, this opened the box at the last but one click of the sequence, despite it being completely different from the correct one highlighted in the walkthrough! the pamphlet has the sliders set at Black-1 Red-6 Green-2 Yellow-3 Purple-5 and blue-4. I set it just like that but it said "nothing happened". anyone know what I did wrong? There are two hotspots for the stalactite above the chasm, one over the entire bottom half, and one smaller one at the very top. You have to use the slingshot on the top one.